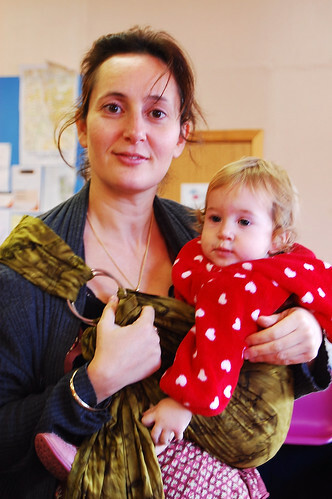 The Sling School is a not-for-profit enterprise which teaches parents the art of babywearing. 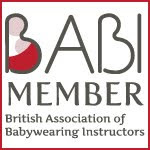 Our team of experienced babywearers founded Manchester’s first community babywearing group, Manchester Slingmeet, also known as Slinging In The Rain, in 2006. We led the group - one of the UK’s first - until 2011, offering support, running workshops and a comprehensive sling library. We also gave sling demonstrations and talks to groups, which have included NHS breastfeeding groups, community groups and midwifery students at the University of Manchester. In 2008, we were awarded the Barclays/ALL FM Community Award for the service the group provided to parents and children. After running Manchester Slingmeet for over five years, we decided to set up The Sling School in 2011. We feel that parents benefit from focused, tailored consultations, with the undivided attention of a consultant, and access to research-based information and a wide choice of high-quality slings. Souad was the first certified babywearing instructor to practice in the UK, after qualifying in France in 2006 (Monitrice de portage with Porter Son Enfant Tout Un Art). She ran Lily Slings (2006-10), selling baby carriers and offering one-to-one babywearing consultations. She is also a breastfeeding counsellor and mother to three children. Jeanette has been babywearing since 2002. She is a clothing and fabric designer, and is the designer of the Zidee Podaegi and the Zidee Mei Tai – two internationally best-selling slings. Jeanette is also a qualified paediatric first-aider and a breastfeeding peer supporter. She is mother to a large family, whose ages range from teenage to toddler. Rachel has been babywearing since 2005. She has written articles on babywearing, writes a regular parenting column in The Mother Magazine, and is a breastfeeding peer supporter. She has three children. Dominique, our business administrator, has been babywearing since 2007. She is a member of the Institute of Certified Bookkeepers, and a former teacher of French and German in adult education. (FAHE/PGCE). She is a treasurer of various charities and a breastfeeding peer supporter. "Discovering slings was a true revelation that led to a more gentle style of parenting a baby" She says. She has two sons.